Is there a happier combination than pink and orange? I guess I’d only need to add yellow to the mix to make this outfit even brighter. 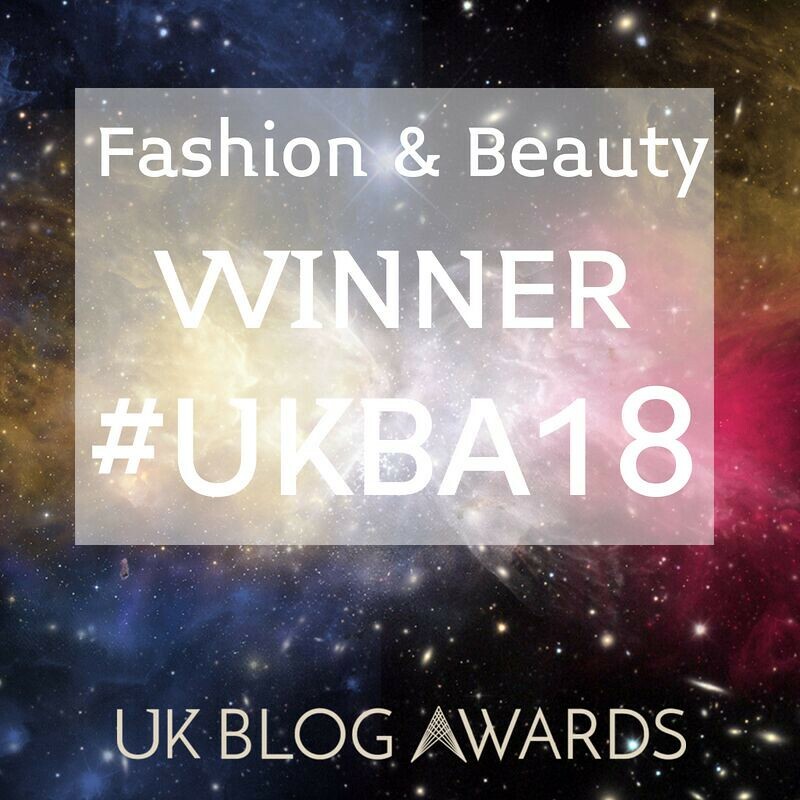 Regular readers may recognise the jumpsuit I’ve worn a few times on the blog, once being with my fave windowpane check jacket and another time when I wore it to the blogger meet I hosted, as mentioned in my top 10 blogging career highlights post last Friday. In fact I loved this jumpsuit so much I bought it in burgundy as well and wore it on Christmas Day… to say I’m getting obsessed with jumpsuits is a bit of an understatement. They are just so easy to throw on and accessorize with pair of statement shoes and a necklace or some other jewellery. For me it’s worth the inevitable bathroom issues, though I know many find wearing any sort of all-in-one an inconvenience. This time the jumpsuit (it’s short-sleeved) just wasn’t warm enough by itself, so instead of wearing something underneath I decided to wear my Winser pink coatigan (similar) over the top instead. 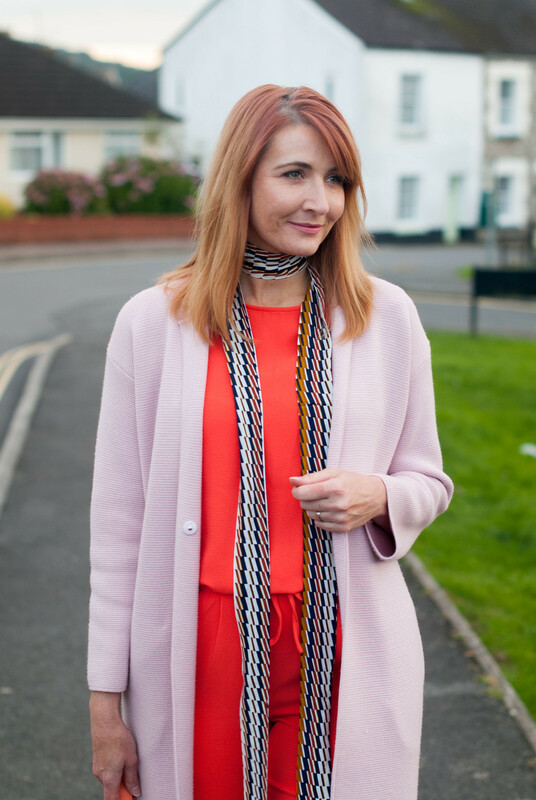 The thing I like about a jumpsuit under a longline coat or cardigan is the “column” that it creates underneath – a coatigan is perfect for that… it elongates the body. Wearing separates in one colour underneath has the same effect, it’s a good trick to remember if you want to create a little body or leg lengthening. What I really love about this outfit though (aside from the rich colours!) are the accessories. I’ve had my eye on a pair of metallic block heel loafers for a while now, and these gold Gucci-style heels were sent to me by JD Williams after I spotted them (or should I say “pounced” on them) at the video shoot I did with the brand the other month. 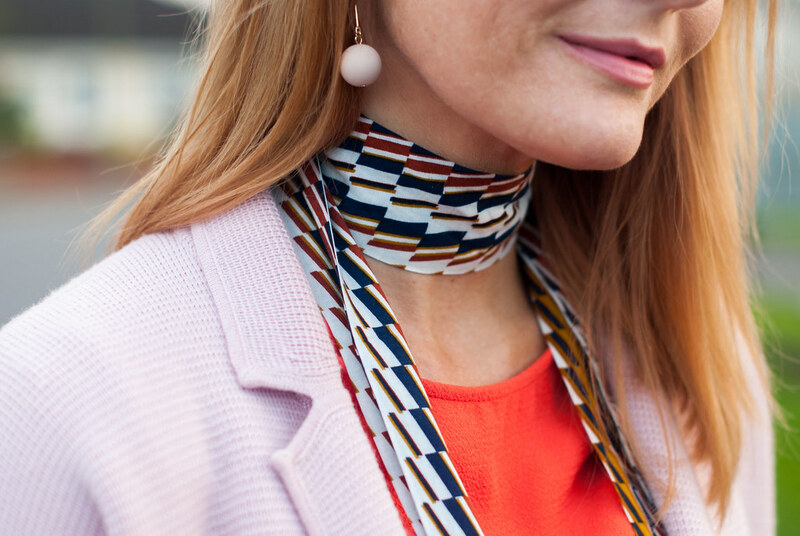 Actually the accessories are more than a little 1970s if you think about it – as well as the block heels the long skinny scarf (similar) is very 70s too. I have a few of these scarves and I really should wear them more often – they have the ability to give almost any outfit that touch of cool. 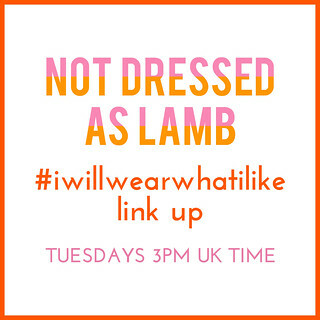 So there you have it for this week’s #iwillwearwhatilike outfit post: I’ll wear clashing brights with gold shoes and a touch of the 70s if I want to – so should you too if colour’s your thing! 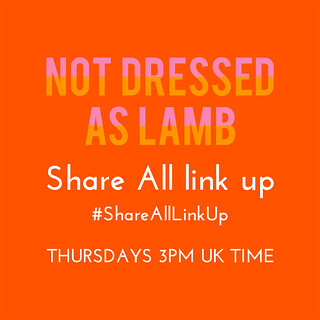 Dooooo add your outfits to this week’s link up – and if you’ve added a link to here, or my button to your post, you may be featured next week. WHAT COLOUR COMBINATIONS ARE YOU CRUSHING ON RIGHT NOW? COMMENT BELOW, OR TAKE IT TO TWITTER @NOTLAMB! Love it! 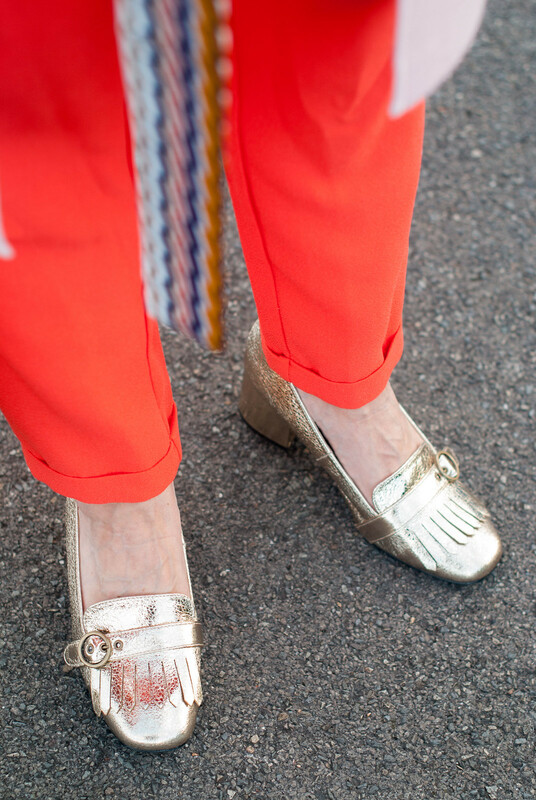 I especially love the metallic loafers. Just one more thing back from the '90s, right? Hope you have a wonderful weekend! Congratulations Catherine on this fabulous new collaboration! I love the advert and think you ladies all come across so well, each of you with your own individual style. Nice to see a couple of familiar faces along with you too! I love your outfit! So colorful and bright! I just love how you wear color! You pull things off with ease tha would intimidate me so. Such a spectacular jumpsuit Catherine! Lovely colours, and great shoes! Sad JD Williams don't deliver internationally. And very good advice on wearing one colour top to toe underneath a cardigan/coat – thank you! The jumpsuit looks amazing under the pink coatigan! I really like pink and red together too. 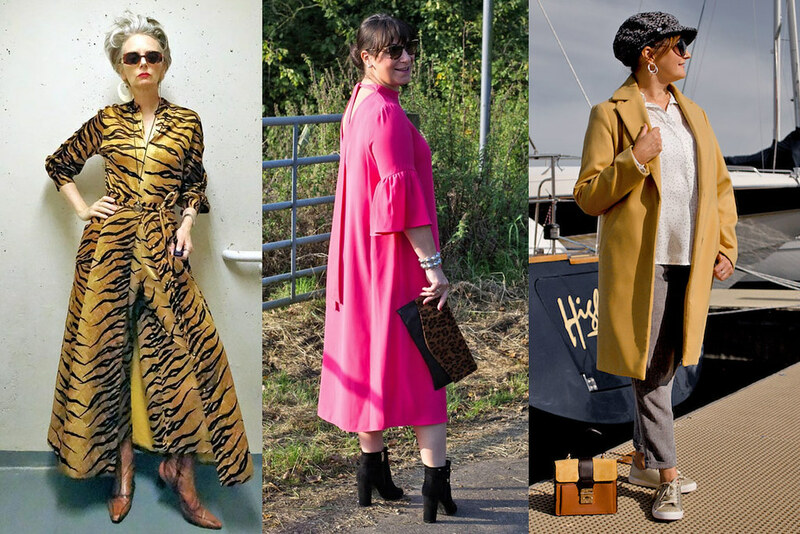 I'm crushing on the Gucci-esque loafers, thankfully there are quite a few high street options now because my budget won't stretch to the real deal! 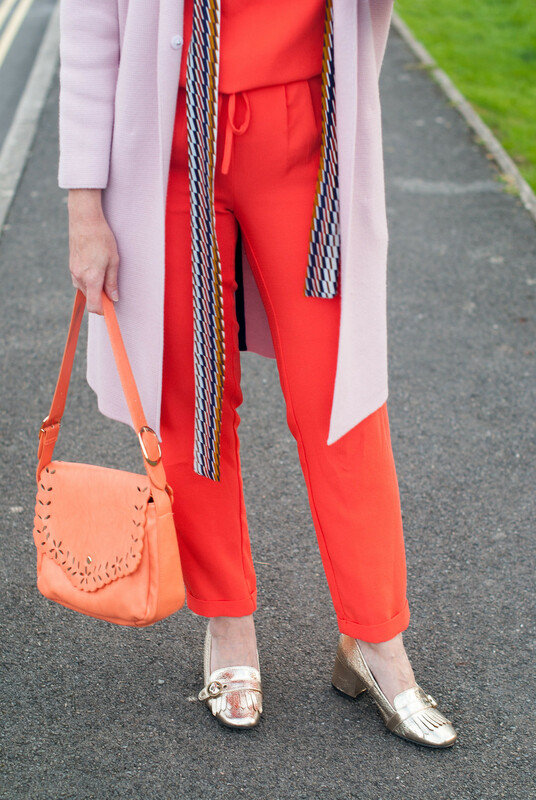 I love orange with pink (or fuchsia) so I am in favour of this outfit. You lucky sxd to get these gorgeous shoes. I watched the video. Really really nice. Will appeal to so many women I am sure. Had to laugh a couple of times too. What a great lot of women. Nice to do this with Nikki too (loved her back flip over the side of the sofa haha). Yea..onesies can be a hassle but you are right about saving time on mix and match. I recently like turquoise a lot. Even my hair is turquoise now. I guess I'm back to liking green again. Lol! I'm sure seeing a lot of this color in blog land. You wear it beautifully! I've got a short sleeved jumpsuit that I've really given up on until the spring but the coatigan makes me think I'll change my mind. Excellent inspiration. A very cheery outfit. This makes me happy Catherine….. a joyous combination of colour! I love your orange jumpsuit and agree wholeheartedly about how easy and fun they are to wear. Your scarf makes me googly-eyed in the best way. Thanks too for featuring me! You were brilliant in the JD Colour Council clip!, but I have to stay they dropped the ball by not featuring all of you in their TV ad. What's up with that?!! At least in the ad they chose models that were older, although it took a little while to clue in because they are all so model-y. I'm happy you were chosen for this great part of their campaign. Such a wonderful combination of warm colours, dear Catherine. It is always such a pleasure to visit you, even if I not alway I leave a comment. I love this! But it's that scarf that is really catching my eye! Just beautiful! 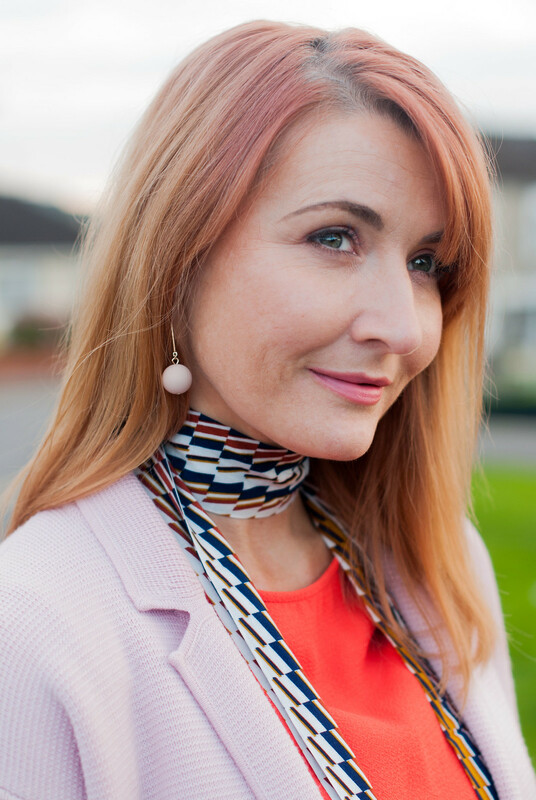 Catherine, orange and pink is a brilliant color combination and you've taken it a step further by turning it into a column effect. The whole look is very fresh and modern even with the throw-back accessories. The gold loafer pumps (I was sporting a similar pair last week) are a lovely pop of surprise in an already fabulous ensemble. Thanks for sharing these styling inspirations and for the link up. The best thing ever? This color combination, Catherine!!! It's so unexpected especially for the autumn and yet it's absolutely perfect!! 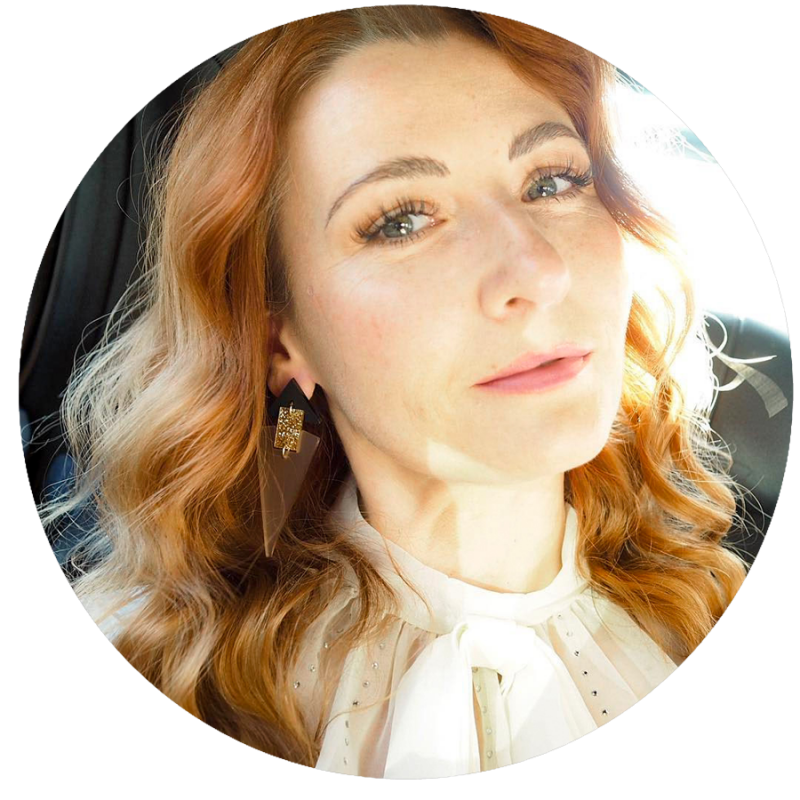 That is one of the many things I love about reading your blog—you are fearless in trying out different colors together, and always make it look so effortless! !